One of the biggest misconceptions people have with online businesses is that you can make a full time living selling a single low-priced product online. Although some people do, it’s quite rare and quite difficult. Those who do, usually have access to a high volume of free traffic, such as a large email database. The reason why it’s almost impossible to make a profit from a single low-priced product is because the traffic needed to sell a low-priced product costs more than the product itself. The smartest marketers usually lose money on their low-cost products and use them mainly for building their customer base rather than making profits. This is why you’ll see over and over again, people working hard to put their first low-priced product online and then realise that they’re not getting any closer to their income goal. The secret to making a full-time income online the fastest and easiest way, where you don’t have to rely as much on generating traffic is by selling high-priced products, ($300 and above) via webinars, as webinars convert ten times more than standard websites. Plus, selling a $300+ product takes the same amount of effort as selling a $30 product. In other words, standard websites convert at 1% (1 out of 100 visitors buy) whereas standard webinars convert at 10% (10 webinar attendees out of 100 buy). 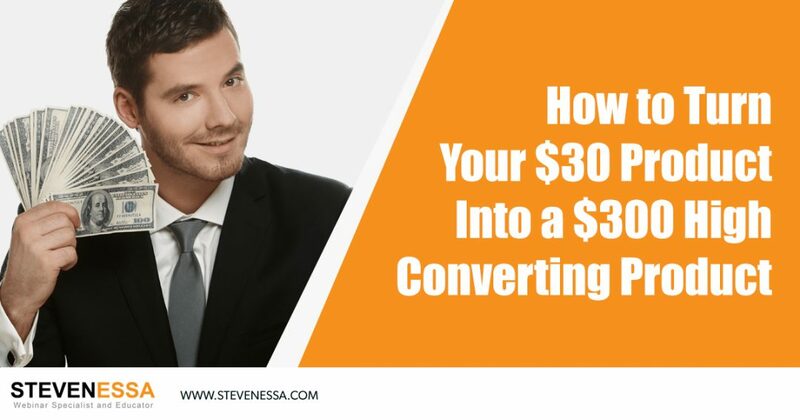 Whereas with a webinar selling a $300 product, you would only need 100 webinar attendees to generate the same income. By offering your product in different formats, people will be more likely to want to pay more for it. For example, authors can turn each chapter of their books into videos and MP3s, allowing people to consume their information in different circumstances such as while they’re driving or at the gym. Plus, it allows to attract a large market segment that doesn’t enjoy reading but still want access to the information. All you need to do, is record yourself reading your book and turn it into an MP3 file. To turn it into a video, simply put together a powerpoint presentation and record it using tools such as “Screenflow” or “Camtasia” and add the audio recording. If you’re selling physical products, this method might not always be applicable, so you’ll probably have to be quite creative to come up with ways to offer different alternatives to consume your product. For example, the company “Juice Plus” offers their food supplement products in the form of capsules, in the form of chewables which are more child-friendly and in the form of a beverage mix. Creating different formats for your products whether it’s a physical product or an information product dramatically increases the value of your product and simultaneously allows you to reach another segment of your market. Another element that dramatically increases the value of any product is adding support. Most customers like to know they can contact someone, should they require help or an answer to their questions. There are many ways you can add support. It can either be through email support, allowing people to contact your business by email, phone support during your office hours, an online chat service, a Facebook group support or a weekly or monthly live call. Since most products offered online don’t offer support, adding a way to be contacted significantly increases the value of your product. For example, should you be selling a course on marketing for makeup artists, you could offer access to a private Facebook group. You’ll soon notice that the group won’t need to be managed closely by you as the group grows, as most group members help each other. Usually the oldest group members help the newest ones. Should you be offering email support, you’ll soon notice that the questions emailed to you are very similar to each other, and could be easily managed efficiently by directing people to a “frequently asked questions” page. Should you be offering phone support and would like to avoid having the phone ring constantly throughout the day, you can choose to only make that option available on a specific day of the week, during a specific timeframe. For example, customers can call in on Fridays, between 9am and 11am. Another way to increase the value of your low-priced product is by adding personal mentoring. Although most product owners would rather not sacrifice their time by delivering personal mentoring in addition to their product, it is a fantastic opportunity to turn customers into brand evangelists who rave about you. The more personalised attention you give to customers, the more likely they will be willing to pay more for your product, the more likely they are going to buy more products from you, the more likely they are to share a positive testimonial about you and the more likely they are to spread the word about you. Should you become too time-poor to deliver one-on-one personal mentoring, you can either increase the price of your product, to generate the same amount of revenue and have less customers to support, or you can turn these one-on-one sessions into live group calls where you mentor people in groups. When you do, you’ll find that your answers to other people’s questions actually benefit the whole group. For example, should you be selling a product on how to increase the conversion of sales calls, one of your bonuses could simply be the recording of one of your sales calls. Should you be selling a weight loss product, your bonus could be a weekly food plan with the recipes. Should you be selling a makeup course, your bonus could be a makeup kit or a rolodex of makeup suppliers. Remember, selling a low-priced product requires the same amount of effort as selling a high-priced product. The sales objections are usually the same you need to answer and eliminate. And don’t forget, people will argue cost only in the absence of value!